A machine for Bottle recycling installed in Mumbai’s local railway station. As per the Swachh Bharat Abhiyan, Government has announced to install bottle recycling machine in all local and long routes railway stations. 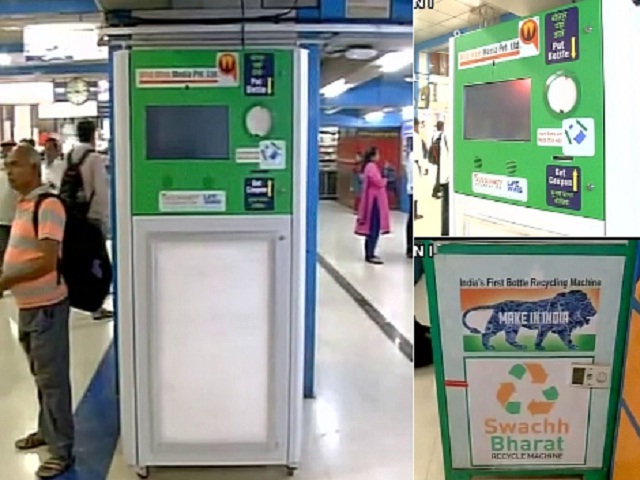 The first Swachh Bharat Bottle Recycling Machine installed in Mumbai’s Churchgate Railway station last year on the World’s Environment Day. The Bottle Recycling Machine enables the users to throw the plastic bottle in the machine which will recycle in for other uses to make clothes, grocery bags. After Churchgate, other stations like Mumbai Central, Dadar, Bandra (local), Bandra Terminus, Santacruz, Andheri, Goregaon, Borivali, and Bhayandar these machines will be installed. The devices installed shows other options like donations, mobile recharge, discount coupons, etc. The Machine manufacturing company Wockhardt Foundations which is in talks with Reliance Jio, Dominos and McDonalds for coupon rewards and discount vouchers.